Apple’s Continuity features have been something that many Android fans have been wanting for a while. The idea of seamless transitions from the smartphone to the PC and back again can add a huge layer of convenience for people around the world. Samsung has been working to get these types of features working with their smartphones, and Samsung Flow has been what they’ve been using to bring this functionality to their customers. The thing is, a lot of these features have been exclusive to Windows PCs that were made by Samsung. This was a bummer for a lot of people but back in February we saw the possibility of Samsung Flow no longer being exclusive to Samsung PCs. Nothing official had been announced, but a response from a Samsung representative to an application review in the Play Store gave a lot of people hope. They said we shouldn’t expect the change to happen until April, but it looks like that update is finally out now. 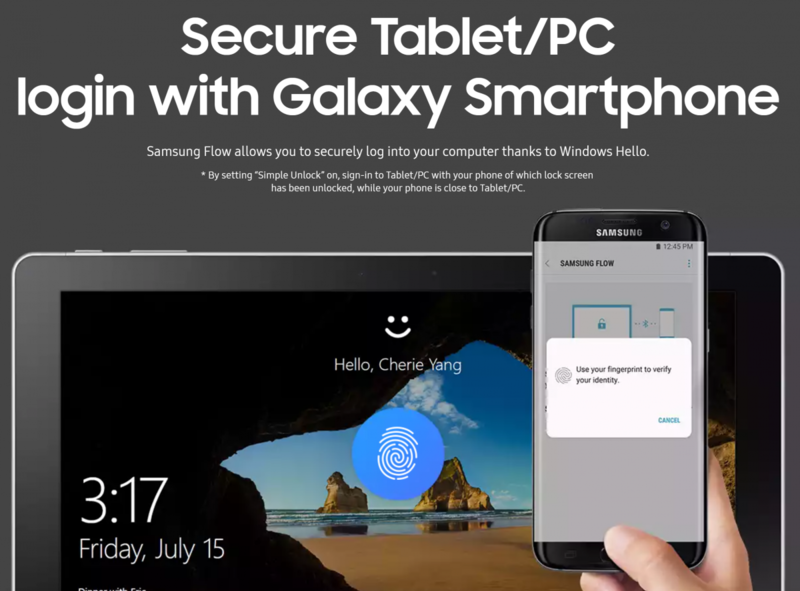 One of the big features that were brought to non-Samsung Windows PCs in latest update were the ability to unlock a Windows device with the fingerprint scanner on the phone. This is possible on the latest version of Windows 10 PCs thanks to Microsoft’s Windows Hello feature. Once the applications are setup on the PC and the smartphone or tablet, you can simply use your fingerprint to log into the PC anytime you’re at the Windows login screen. Another important feature here that was made possible thanks to the latest Samsung Flow update is the ability to sync your smartphone notifications right to your computer. Again, this was possible with Samsung Flow before, but only if you were using it with a supported Samsung Windows computer. Now, as long as you have the new Windows 10 Creators Update on your PC (and a supported Samsung smartphone or tablet), then you can sync your notifications directly to your computer. Samsung says that for this to work, you need to have a Samsung tablet running Nougat or higher (like the Galaxy Tab S3), or you need to use a Samsung smartphone that is running Marshmallow or higher. They mention devices like the Galaxy S8, Galaxy S8+, Galaxy S7, Galaxy S7 Edge, Galaxy S6, Galaxy S6 Edge, Galaxy S6 Edge+, Galaxy Note 5, Galaxy A5 and the Galaxy A7 in the application page.